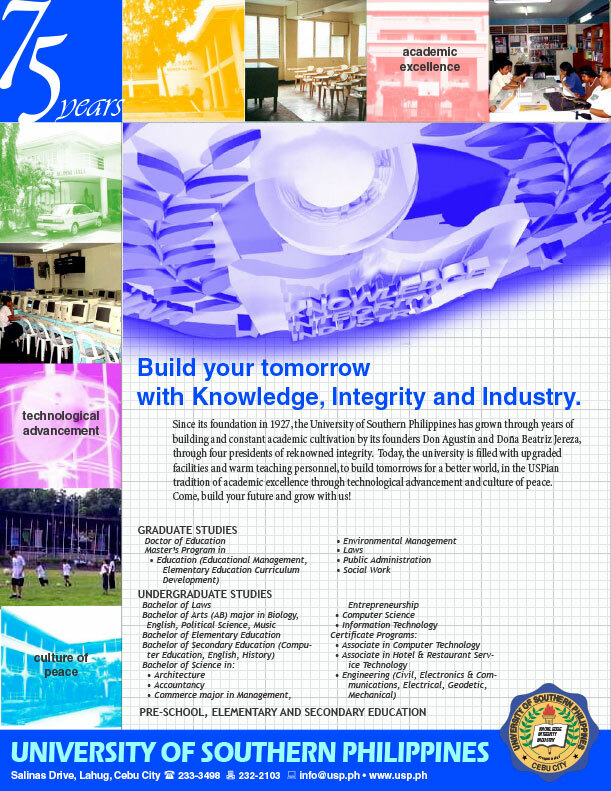 Proposed full color advertisement design for Cebu 2002 Yearbook. This work was rejected in favor of an outsourced design. Probably because it conforms too much with future-scientific tastes which are hardly appreciated by women in general. Another thing is probably the block and linear type of composition used in the lay-out design. Even colors are grouped in blocks and lacks the dynamics of a fluid design, which was what the client preferred during that time. After all, it was supposedly a Php35,000.00 full-color ad placement in the Cebu 2002 Yearbook and it had to be powerful enough to seemingly jump out of the glossy page into the reader’s lap. Our intended look here is that of a technologically modern, solid and stable organization. It is meant to be in conjunction with USP’s 75th Year Anniversary theme of academic excellence, technological advancement, and culture of peace. Taking advantage of the publication to be in color, we had used single colors to set every other block to represent a certain core value: whether of technology, peace, prosperity, or endurance. Then again, it’s the client who prefers how these ideas are expressed in advertising.